The New American Bible (NAB) is a most common English Catholic Bible translation. The first version was translated from the original languages and published in 1970. Second and third revisions of NAB were made in 1986 and seven years later in 1991. What is called “New American Bible Revised Edition (NAB-RE)” is the fourth edition of NAB released in 2011. Version consists of the second revision from 1986 of the New Testament and of the fully revised and approved Old Testament. NAB-RE is the result of 20 years work of around hundreds of theologians and Bible scholars. The project was sponsored by the Confraternity of Christian Doctrine. Translators managed to ensure an accurate translation by taking into account advances in linguistics of the biblical languages, cultural background of English and changes in vocabulary. In addition, they followed the best possible textual tradition. It is very readable Catholic Bible translation. NAB-RE is more literal translation than the first version of NAB and more consistent in rendering original (Hebrew and Greek) words and idioms. It is one of the easiest version for understanding and for this reason is perfect for everyday use. Translation is especially popular among students and those who are new to reading Bible. The NABRE is approved for private use and group study. It is not used for the Liturgy, which uses an older version of the NAB translation. It is not possible to buy an older NAB translation to exactly match the Mass readings because they are no longer in print. But NABRE is very close to the reading you can hear at Mass. For you who are looking for New American Bible, I have reviewed a different variety of forms. These are my top choice among online offering. 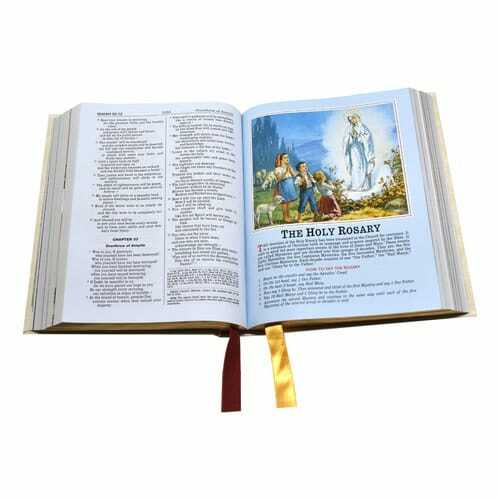 New American Bible Revised Edition (NAB-RE) personalized First Communion Bible is available in blue for boys, rose pink for girls and universal white color. 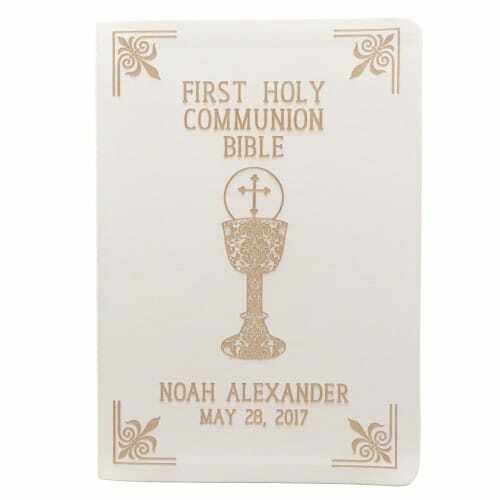 For First Communion gift, I suggest getting a white one, because white color symbolized this Holy Sacrament. The personalized New American Bible Revised Edition (NAB-RE) s the perfect sacramental gift and an ideal gift for any special occasion. Featuring a dove, this unique reminder of the Holy Spirit. The front cover is adorned with an elegant filigree pattern. This is a gift that will be cherished for a lifetime and can be handed down to the next generation as a treasured heirloom. Bible is personalized with the name, and date of your loved one’s Confirmation. Note that the second line of the inscription is your choice. Just enter “Confirmed in Christ”, “RCIA“, or “blank” when checking out. This is a one-of-a-kind gift that your recipient will appreciate for years to come. The edition contains a 3-year liturgical cycle of Sunday readings, a 2-year liturgical cycle of daily Mass readings, a listing of Popes, full-color maps, and a manual of favorite Catholic prayers. Bible is usually shipped in 1-2 working days. You can choose a black, red, blue, pink or white cover. St. Joseph Ivory Bible This version has the 1986 revised New Testament, the 1991 revised Psalms, and the 1970 Old Testament version. This New American Bible is a wonderful gift for any couple celebrating the Sacrament of Holy Matrimony. This popular size raises its high-quality standards even further as it offers more beautiful and elegant features. 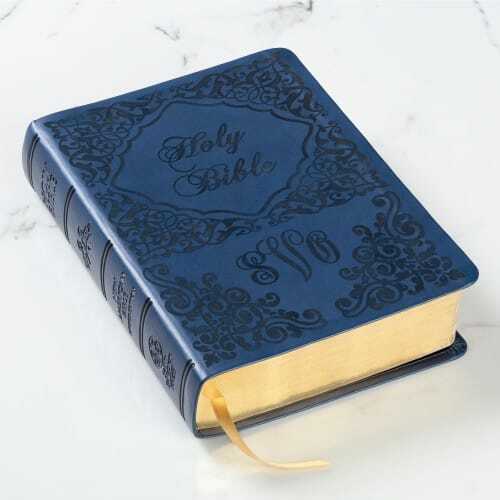 Supple material, blind embossing, foil stamping, precise stitching, and decorative gilding combine to provide a unique package for the Word of God. In addition, this Marriage Bible is gold stamped with a Cana cross on the front cover. The distinctive features of St. Joseph Editions include Family Record and new maps. Personalization is available. You can order to engrave a couple’s last name on the cover of this beautiful bible. The Family Edition of the St. Joseph New American Bible is one of the most elegant editions. Large print with 14 pt font enables an easy reading. The edition includes over 100 full-color illustrations on the life of Jesus and the Apostles, maps of the Bible Land and photographs of the Holy Land. In addition, there are Bible Dictionary, Doctrinal Bible Index, chronological charts of Bible history, and a How-to-Read the Bible section. This version of St. Joseph New American Bible also features specially designed endpapers, list of 3-year Sunday Mass readings, presentation page, distinctive Family Record Section, color pictures and explanation of the Mass, Rosary, and Stations in picture and prayer. This United States Conference of Catholic Bishops (USCCB) Gift Edition of NABRE includes a brief introduction to each book in the Bible, a preface to the Old Testament and New Testament, and extensive notes and cross-references on each page to help you dive deeper into Word of God. This edition can be a special gift that offers a superb reading experience. This prayer tool is great for family reading, sharing, and conversation about bible values and teachings. The print is large and bold. What makes the USCCB edition better is that the print is larger and bolder. This bible is exactly what I expected. The print size is easy to read and I also like the references. This St. Joseph Edition published by Catholic Book Publishing Co includes new maps and Family Record. This popular size raises its high-quality standards even further as it offers more beautiful and elegant features. High-quality cover, easy to read print, with great detail explanations on the bottom of the page, nice pictures, maps, and drawings complete this exceptional gift. 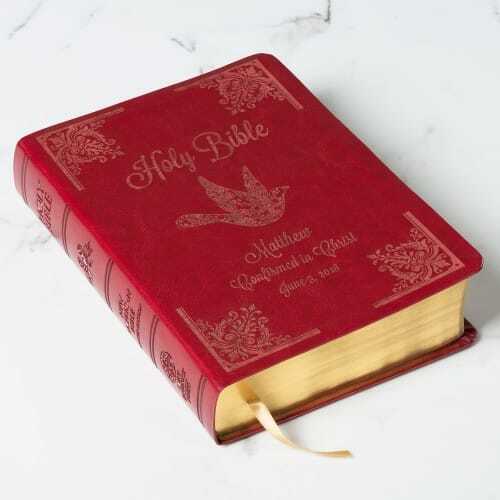 This New American Bible Revised Edition from Fireside Catholic Publishing is bound in elegant leather with old-fashioned features like gold, and burgundy engraved cover, raised hub spine, gold-gilded page edges, and two silk ribbon markers. Features: Family Record section In the Arms of God The Celebration of the Eucharist Pope Francis and The Vatican Stories of Christmas and Easter Our Catholic Family (new section).